Forum Description: A forum for just about anyone. We have RP, Graphics and stories. We are guest friendly. -Writing areas, both for fanfic writers and original story writers. -Graphic areas, for members who make graphics. -Art area. Show off your artwork. -Monthly Events, Earn stamps, gold, and ranks. -Shops in the Black Market or set up your own shop. -Yearly Festivals for 3 events. Valentine's Day, Halloween, and Christmas. More festivals may be added. -Collectable Stamps, for any member who likes collecting things. -Free Promotions. Share your forum. Just have a link back area for us. More may be added in the future. -Fanfictions - New areas for fanfics! New areas are will be added randomly. Location : Lost in darkness, send Riku if you need me. Updated a lot of things. Theme was updated and looks a little better. Staff needed: Co-admin, Graphic mod and Writing mod! Now you can have Pokemon starter of any PKM from the games on your profile. It's something for all PKM fans out there. Added a few new areas for fanfics, will add more as time goes on. So writers, come and share your stories. Added some Special Ranks for members to get. Also I might add some stamps that members can earn and 'buy'. but I don't know yet. TW forums now has stamps but they are WIP. A few more things were added to the site shop, and a few new areas appeared. Might redo the RP areas to something different. Less like Gaiaonline but still free-4-all. hmmm. Role-play areas were redo. All the role-play areas are now planets that details of them are all WIP yet free to play around with. New area - Library of Codes which is for anyone who like writing codes can now share. Added a cbox for guest and members. new theme. Working on icons/buttons for it but still all new. Will add daily games to the list. I been working on the achievement stamps and now there are 26 made so far. I so started on the packs that members will be able to buy with their forum gold. The packs will have 10 random stamps by theme in them. Sadly, I need some help with the stamps. So anyone interested in helping, let me know. If they are achievement stamps, would you not earn them, instead of buying them? They are achievements but I'm making a lot of normal stamps that members can buy or get from the daily stamp thread. I'm doing something like this fourm is doing, but more original and random that works for TW forums. Members can now get daily stamps. Added another way to earn Gold and that's by referring ppl to TW Forums. The most gold you can earn is 100,000 with a stamp and Sp. Rank! Got a new staff member. -took a kitten from RPG-D. Welcome Wench Kitten to the staff! -New Ad to share out. School event ended. Sadly it didn't do good this year. Two spots open for now. Graphic mod- Must know how to make graphics! Basic is okay, since Kitten and I are still learning. Writing Mod- Must be good at writing! Role-play Mod - Must know how to RP and can come up with plots for Events. PM me on here if interested. Added a few areas to the RP folder. I'm starting to add towns/cities/etc for you guys/girls. updated the first post, so it's....longer. added a Main RP area that is locked until it's done. It's WIP. Added another new place that is based on Sims, but a good way to earn more gold. -New theme for Fall soon. (SalyaDarken will be offline for a few days. She is getting married Nov 3 in RL) Done. -Daily Stamps are on Hold since Salya needs to make more when she gets Better Network. Festival of Fears is now closed for the year. Still looking for Mods. And members to RP with. New home icons was added. -New icons added to the forum, so it's more interesting? -WIP Main RP theme is now Angels, Demons, and Magic with some high tech and fantasy. Festival of Snow opens up tomorrow! -Theme was updated a little. -News board was updated with a better name and dec.
-Staff hiring post was updated with better detail. -added a few new emotions. 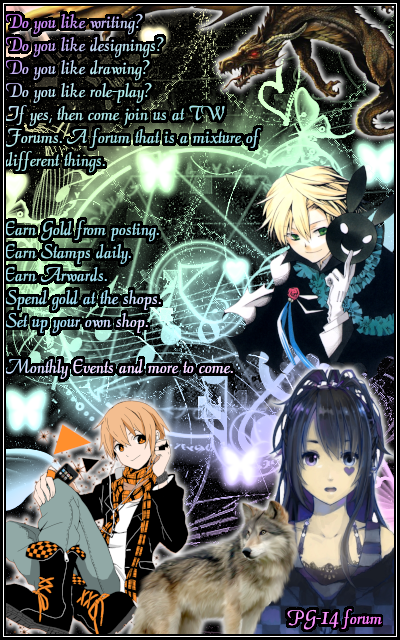 -Half Moon Shop got an header and an NPC. There is an Event going on! Anyone who joins this month and posts in the Introduce Yourself board then you PM me or I will PM you with a Hidden Stamp. there are 10 hidden stamps! added a few more areas in the fanfictions area for the fanfic writers.